From kittens to cows to bowls of mush, the familiar images from his father's illustrations in Goodnight Moon inspired Thacher Hurd to create Goodnight Moon 123. The same comforting images find new expression in this counting companion to the classic bedtime book, now available with a padded cover for the youngest readers. The companion concept book, Goodnight Moon ABC, is also available as a padded board book for your enjoyment. 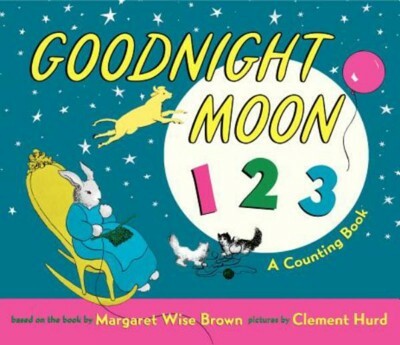 Editor's Review: From kittens to cows to bowls of mush, the familiar images from his father's illustrations inspired Thacher Hurd with the idea for Goodnight Moon 123. These comforting images find new expression in this counting companion to the classic bedtime book. Few writers have been as attuned to the concerns and emotions of childhood as Margaret Wise Brown (1910-1952). A graduate of Hollins College and the progressive Bank Street College of Education, she combined her literary aspirations with the study of child development. Her unique ability to see the world through a child's eyes is unequaled. Her many classic books continue to delight thousands of young listeners and readers year after year. Muy pocos escritores de literatura infantil han logrado captar las emociones e inquietudes de la niñez como Margaret Wise Brown (1910-1952). Sus numerosos y ya clásicos libros y grabaciones continúan deleitando a lectores y oyentes de todas las edades. Clement Hurd (1908�C1988) is best known for illustrating Goodnight Moon and The Runaway Bunny, the classic picture books by Margaret Wise Brown. He studied painting in Paris with Fernand Léger and others in the early 1930s. After his return to the United States in 1935, he began to work in children's books. He illustrated more than one hundred books, many of them with his wife, Edith Thacher Hurd, including the Johnny Lion books, The Day the Sun Danced, and The Merry Chase. A native of New York City, he lived most of his life in Vermont and California. Clement Hurd (1908�C1988) se graduó de Yale University. Estudió pintura en París en los años 1930 con Fernand Léger, entre otros. Allí fue donde desarrolló su estilo característico, compuesto de colores de fuerte contraste. Hurd estuvo casado con la escritora Edith Thacher Hurd, con quien también creó muchos libros que se convirtieron en favoritos de los niños.